Did you used to play roleplaying games back in the day, delving dungeons with funny dice in hand? Why’d you stop? Find out how to reclaim your RPG hobby as a working adult. Well, GM's Journal #8 wasn't the last entry. Oh no. You guys got on Anchor and sent me a barrage of lovely voice messages which I have collected together in this episode. Additionally, I've hacked together the thoughts and mumblings from the past four or so days into a follow-up journal. The long and short of it is that I have come to realise something very powerful about my Gamemastering. As ever, this is a laid-bare peek behind the GM's screen and not for the faint-hearted. Enter at your peril! Rough edit from a rough week at the table. Shennanigans at the school club leading to the death of four characters, followed by the fourth Friday Night Roleplay session on the Isle of Fire going ... erm ... badly, leading to a TPK. As ever, this is a laid-bare peek behind the GM's screen and not for the faint-hearted. Enter at your peril! Will this be the last entry in the Journal? You decide! Mash-up of clips from my day out to Birmingham on Saturday 30th March to attend Glorantha Games 2019, a convention held at Geek Retreat to celebrate the world and games of Glorantha. Organised by Pookie and Darren Happens, the show was run to raise money for Shelter and bring together the tribes of UK Glorantha fandom. It was my first convention in about 15 years and an amazingly positive experience. Forgive the awful audio quality at times - I just wanted to share some of the moments I experienced in a great day out. Game on! This episode is a grab-bag of moments from the week: unboxing the Black Hack, prep for the school game, thoughts on Traveller, and ending the week with a trip to Ludorati in Nottingham. As ever, this is a laid-bare peek behind the GM's screen and not for the faint-hearted. Enter at your peril! Not sure how coherant I am but you guys are used to the format, right? Game on! The twists and turns in my hobby over the past week or so, in what has been one of the toughest in my career, along with many of the joys that come from gaming. While editing it occurred to me that roleplay adventure games might be the cornerstone of my sanity. More detail on the school club and a post-game ramble after the Saturday night game using Fantasy Grounds. As ever, this is a laid-bare peek behind the GM's screen and not for the faint-hearted. Enter at your peril! Taking a bit of a risk, this episode discusses five games that have had a great impact on me. Along the way, I also touch on various matters of taste and icons who have influenced my play style. It's a bit of an indulgence through which I hope others might also find some inspiration. A third dose of my GM prep ramblings during which I share my preparation for the Rise of The Dragon Kings campaign using Castles & Crusades. I touch on where the school club game is and mumble some thoughts on the Saturday night game too. This is a laid-bare peek behind the GM's screen and not for the faint-hearted. Enter at your peril! Follow-up to the first bonus episode which records my #SoloAModule month efforts, this is the first adventure from the Alternity Starter Set 1999. I've tried to make my gibberings more entertaining but, in the end, it's one man gaming alone. But I did have a good time. Enjoy! It's Solo A Module Month and, following the last episode on getting into solo play, I thought I would take part. In short, Spencer Salyer from the Lone Wolf Roleplaying group on MeWe (formerly on G+) has set the guys there the challenge to solo play a module sometime during March 2019. I got the itch to play my all-time favourite SF RPG just before #SoloAModule was announced and decided to throw my lot in to do a very special blast from the past. This is a very rough intro to my plan for March in which I learn to play the game I've chosen. Hope it's worth a listen. Here it is: a second helping of my GM prep ramblings during which I share my preparation for the Rise of The Dragon Kings campaign using Castles & Crusades. This is a laid-bare peek behind the GMs screen and totally not for the faint-hearted. Enter at your peril! Following on from last week, I hopped online and had a chat with Carl Bussler. He is the co-founder of Stormlord Publishing, hosted and produced the Flagons & Dragons podcast, and is currently the host of The Megadungeon Podcast. Carl lives in a little town near Philadelphia where he works as a Videographer and Photographer. Here's a link to The Megadungeon Podcast Massive thanks to Carl for coming on the show and sharing his thoughts on why megadungeons are ace! Having a stab at defining the concept of a "megadungeon", we take a look at the dungeoncrawl as the best and most successful game structure from the standpoint of a person who wants to play a foolproof game. The episode piles on the reasons why both players and Game Masters ought to be able to enjoy the megadungeon’s pleasures. We also note that the megadungeon does not, in any way, limit your play options in the longer term. Here are the links I promised in the episode: The Megadungeon Podcast: Episode 1 The Alexandrian blog post: “Game Structures Part 3: Dungeoncrawl” Dungeons & Dragons Red Box (1983, aka BECMI): Player's Guide and DM's Rulebook Barrowmaze Complete: Labyrinth Lord, aka 1981 B/X D&D Edition Barrowmaze Complete (5e): 5th Edition D&D Shiny Shiny Edition Barrowmaze Level 1 Map: Level 1 Map Only Peter Dell’Orto’s “Dungeon Fantastic”: Megadungeon Mapping Best Practices Part I B/X Essentials free .PDFs Adventures & Treasures and Monsters Game on! 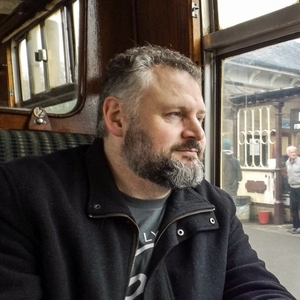 Following on from the last episode, in which I outed my story of discovery and the success experienced with B/X Essentials, I hopped online and interviewed the author of that product: Gavin Norman. Here are the questions I started with: - What is it that you enjoy most about roleplaying games? - What is your biggest barrier to getting a game? - What was the worst moment in your roleplaying hobby? - How do you keep yourself motivated to play? 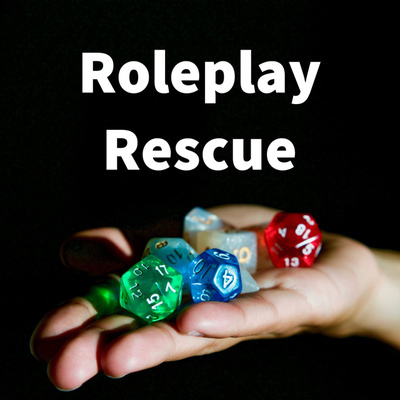 - What tips do you have for a person coming back to the roleplaying hobby? From there, we talked about the reception of B/X Essentials, plans for the future of the line, and a little about his Dolmenwood setting. Here are some links related to the interview: Necrotic Gnome: http://necrotic-gnome-productions.blogspot.com/ B/X Essentials .PDF Bundle: https://www.drivethrurpg.com/product/246226/B-X-Essentials-PDF-Bundle-BUNDLE Dolmenwood: https://www.drivethrurpg.com/browse/pub/5606/Necrotic-Gnome/subcategory/27522/Dolmenwood Many thanks to Gavin for braving an unknown interviewer and coming on the show! Sharing my own journey of revelation about roleplaying games and describing one route back into hobby. This is the story of what happened to me in July 2018 when all the reading, thinking, and self-doubt finally opened a way to enjoy my hobby again. I hope it can inspire others to consider a trip back to the gaming table. Here are the links I promised in the episode: The Angry GM’s, “GMing, Basically” series: https://theangrygm.com/series/gm-basics/ The Alexandrian, Justin Alexander’s, “Open Table” series: https://thealexandrian.net/wordpress/1223/roleplaying-games/opening-your-game-table Jennell Jacquays’, “The Caverns of Thracia” megadungeon: https://www.drivethrurpg.com/product/127336/Caverns-of-Thracia-1979 B/X Essentials (art-free) $0 .PDFs: Core Rules - https://www.drivethrurpg.com/product/220729/B-X-Essentials-Core-Rules--Plain-Text-Edition Classes & Equipment - https://www.drivethrurpg.com/product/227658/B-X-Essentials-Classes-and-Equipment--Plain-Text-Edition Cleric & Magic-user Spells - https://www.drivethrurpg.com/product/233175/B-X-Essentials-Cleric-and-MagicUser-Spells--Plain-Text-Edition Monsters - https://www.drivethrurpg.com/product/246582/B-X-Essentials-Monsters--Plain-Text-Edition Adventures & Treasures - https://www.drivethrurpg.com/product/253083/B-X-Essentials-Adventures-and-Treasures--Plain-Text-Edition Add dice and play! What Are Roleplaying Games, Really? What Stops You From Gaming? Taking a look at three big barriers to playing RPGs like Dungeons & Dragons, Traveller, or RuneQuest. This episode introduces some of the key reasons many folk will drop out of the hobby. None of this is rocket science yet it affects gamers everywhere at some time or another. Here are a couple of links to items mentioned in the episode... Andy Cope's & Andy Whittaker's book, "The Art of Being Brilliant": https://www.artofbrilliance.co.uk/shop/1/the-art-of-being-brilliant My own blog: http://ubiquitousrat.net A big thank you to Ravi Bains who designed the new artwork for the podcast - thanks, Ravi!